This endemic weevil lives in the North and South Islands of New Zealand where its main host plants, medium to large-leaved rata (Metrosideros) species, occur. The weevil lives on host plants in city gardens and parks as well as in native ecosystems. 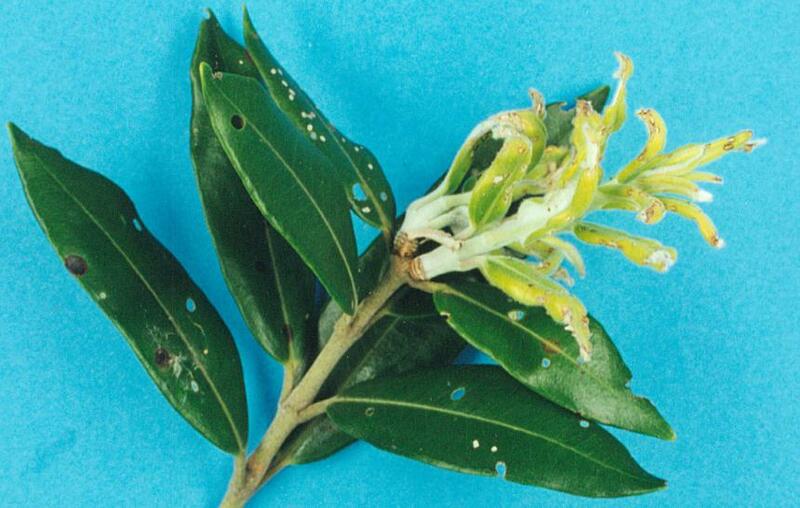 The adult chews young leaves, while the larvae tunnel in leaves. 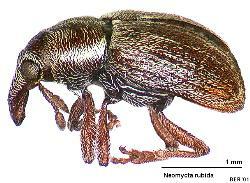 Adults are typical weevils, each with six legs, hard wing covers (elytra) and a long snout (rostrum). They are small, about 3 mm long and brown. Their wings, which are longer than the wing covers, are kept safely folded up under the wing covers, except when needed for flying. A pair of jaws, or mandibles, is at the end of the rostrum and on either side of the mouth. The antennae are also attached near the tip of the rostrum. 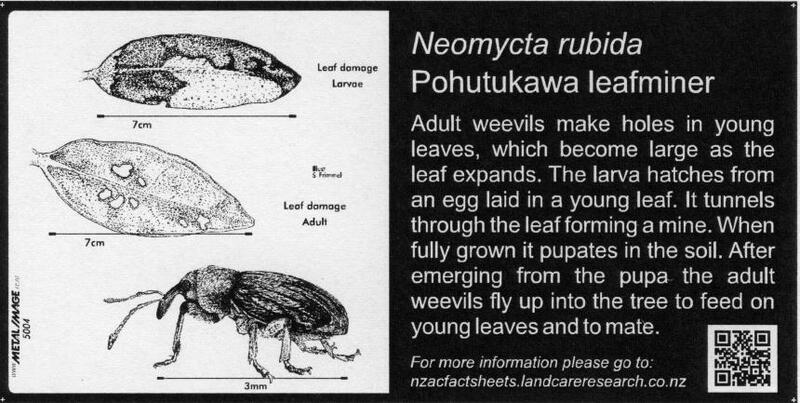 Female weevils start laying eggs when new leaves appear. A single egg is inserted into the blade of a young leaf. 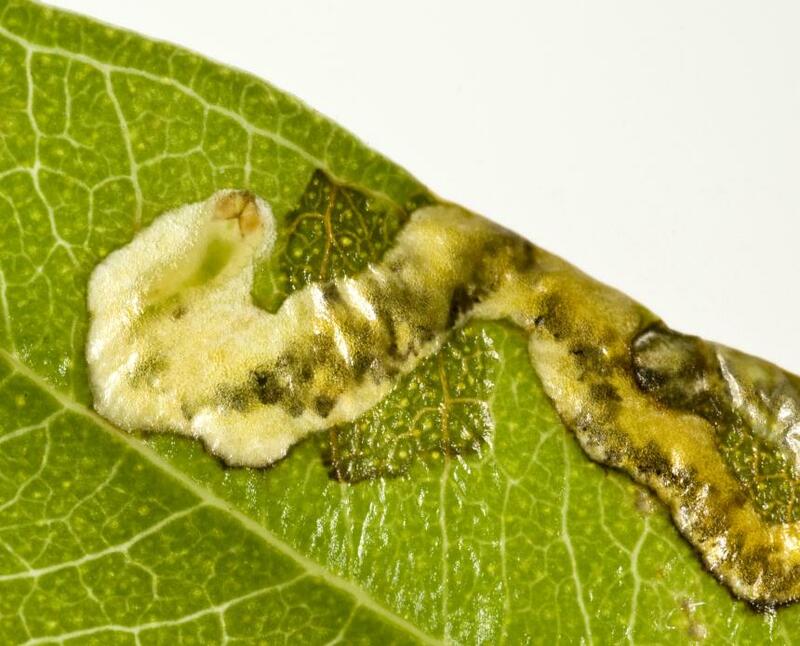 After hatching from an egg the larva tunnels into the leaf forming a serpentine mine that gradually gets wider and may end in a blotch. 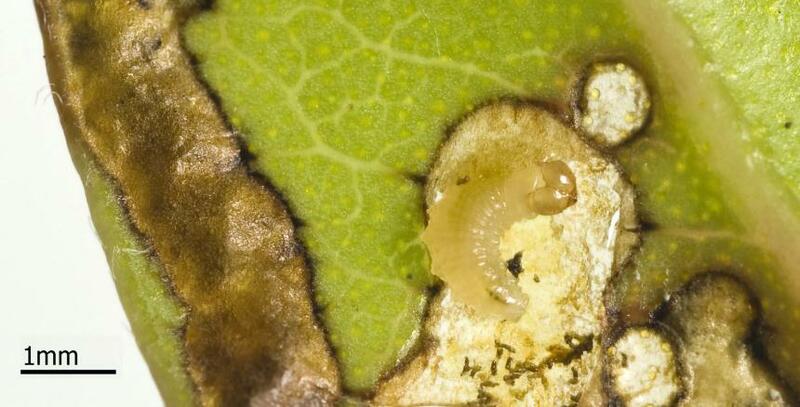 If a larva consumes all of a leaf, it can transfer to another leaf. 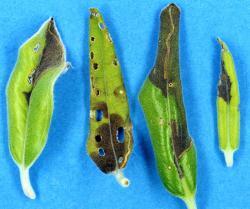 Larvae can also complete development if the leaf falls from the stem. Larvae are whitish, with no legs and a brown head capsule that has a strong V-shaped invagination on the upper (dorsal) side. Larvae have large jaws at the front of the head. As a larva grows, it changes skins (moults). 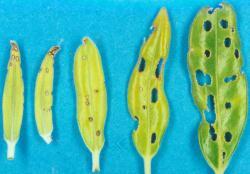 It is not known how many larval stages (instars) this weevil has. Larval development usually takes about three weeks. When it is fully grown, the larva cuts a slit in the leaf skin (epidermis) covering the mine, crawls out and drops to the ground. It burrows into the litter or soil and makes a chamber in which it pupates. 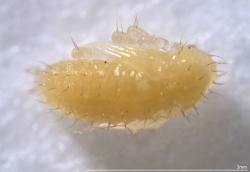 The pupa is white with all the appendages of the adult weevil visible - long legs, rostrum (snout), wings and wing cases. 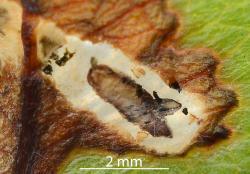 If the chamber is opened, the pupa waves its abdomen about. On emergence from the pupal skin, the adult weevil stays in the pupal chamber until the skin (cuticle) hardens and darkens. After leaving the pupal chamber the males and females find one another and mate. 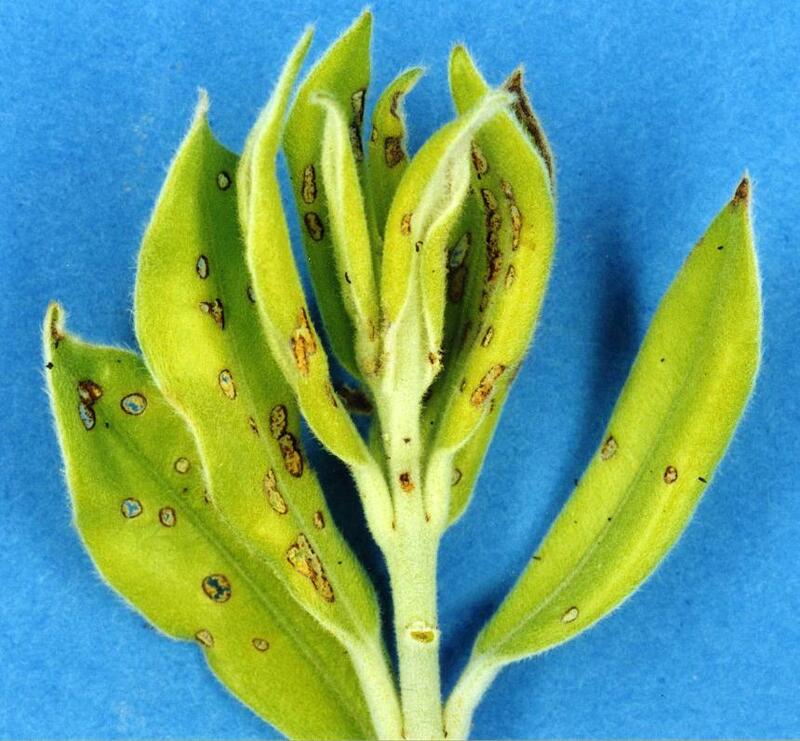 If suitable young plant foliage is available, they feed and lay eggs, even in winter. However, most emerging adults wait until spring and the new flush of foliage, before laying eggs. Adults feed at night and hide during the day. They drop to the ground if disturbed. The mandibles of the adult are at the tip of the rostrum. 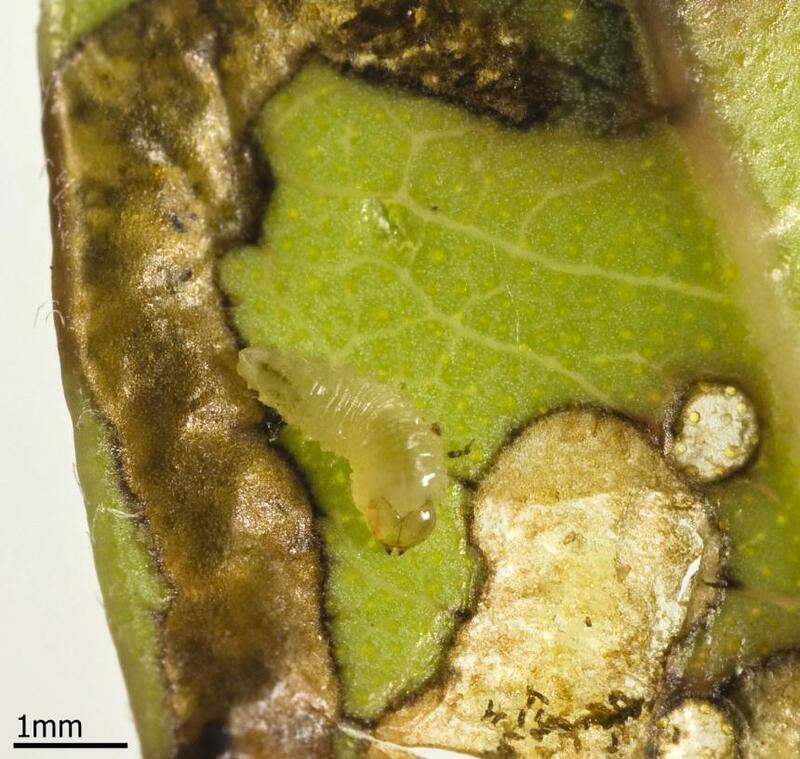 When the adult wants to feed, the rostrum is pushed onto the leaf surface and the mandibles bite the leaf tissue, making a small round or oval hole in the leaf. 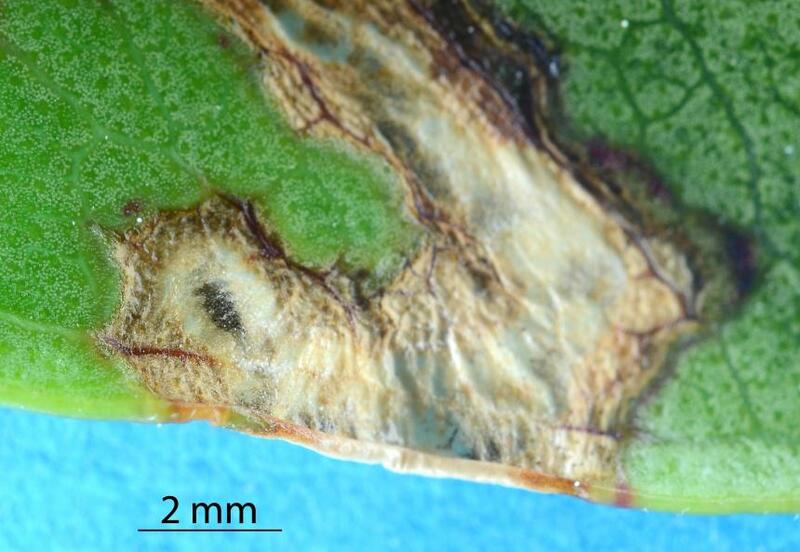 The weevil does not eat right through the leaf, but leaves the skin (epidermis) on the far side of the leaf intact, so creating a ‘window’. 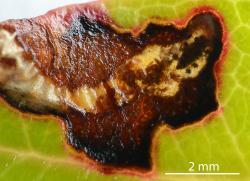 When a young leaf expands, the hole enlarges and the epidermis breaks, creating a see-through hole. 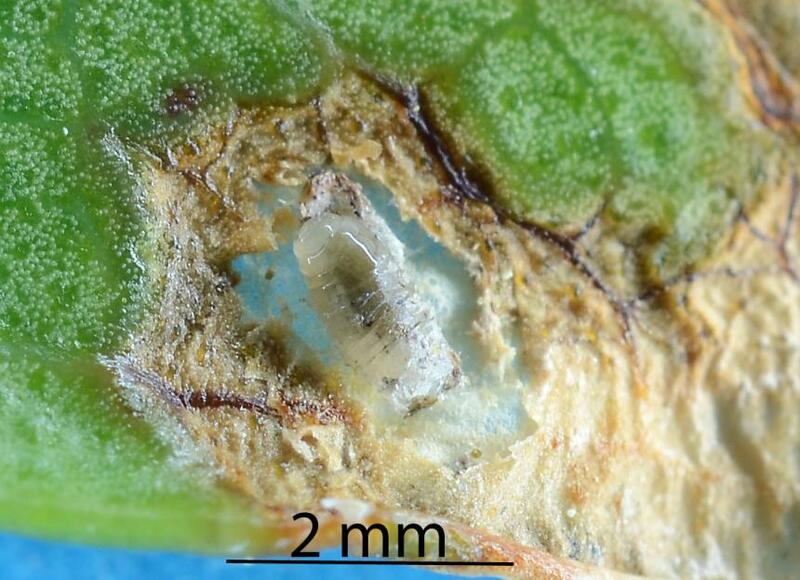 When an adult feeds on a fully expanded leaf, the ‘window’ remains intact. 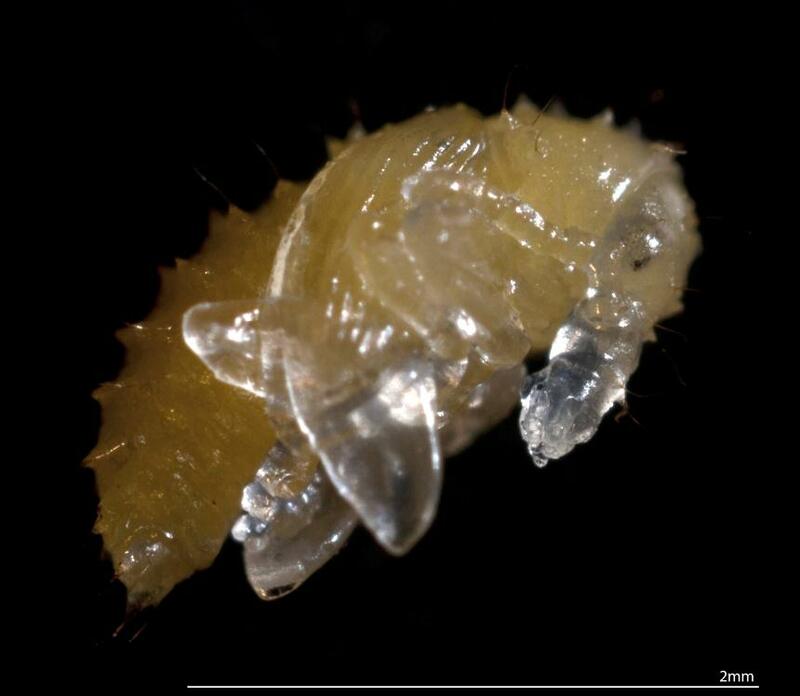 The larva also has mandibles (jaws) at the front of its head. It uses them to create a tunnel in the leaf. It ingests the internal tissue of the leaf and leaves the upper and lower skins of the leaf intact. Weevil larvae can feed in leaves while they are attached to the plant and after they have fallen. 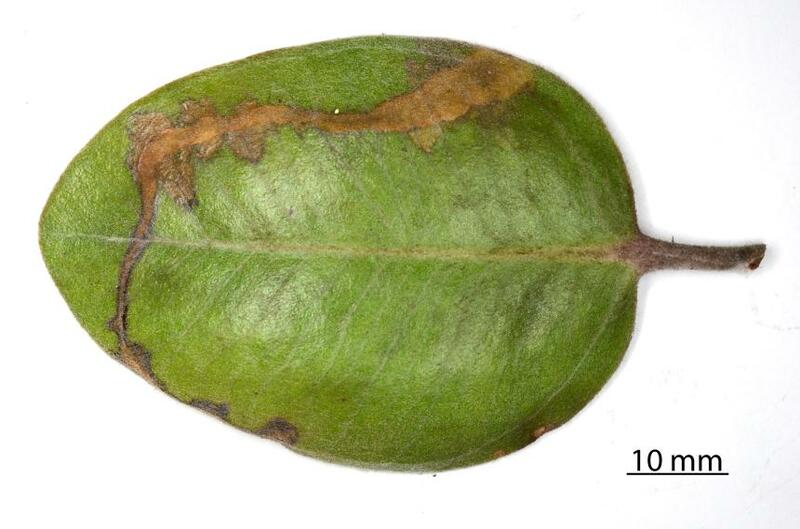 The digested leaf tissue is excreted as discrete pellets (frass) that back-fill the mine. The pohutukawa leaf miner weevil is the only insect forming mines in leaves of pohutukawa and rata (Metrosideros) trees. 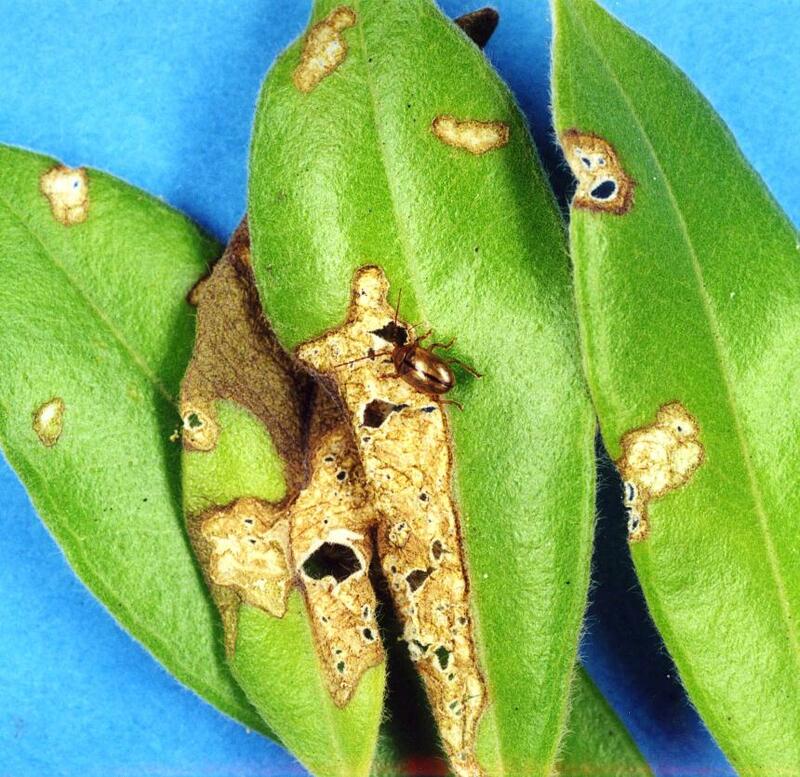 The adult damage to leaves can be confused with that caused by adult chrysomelid beetles in early summer after the main period of weevil feeding is over. These beetles are related to bronze beetle (Eucolaspis brunnea) and at least two species feed on pohutukawa leaves. One species (A) feeds on very young leaves and removes large areas of leaf tissue on the upper or lower surface of the leaf, leaving a layer of epidermis. This species is usually found near sandy beaches. 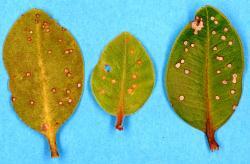 The other species (B) makes large ragged holes in young leaves. 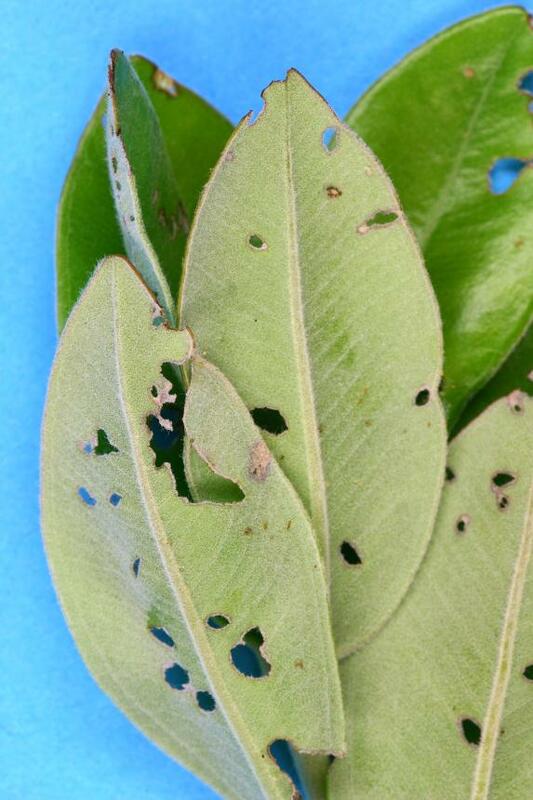 Small holes or ‘windows’ in leaves are a sign that weevils were present. Adult weevils are probably preyed on by birds and spiders, but no observations of predation have been reported. 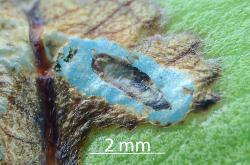 One or perhaps two un-named wasp parasitoids have been found in pohutukawa leaf miner weevil mines. 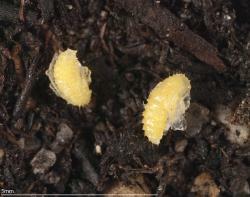 The larvae live in the weevil larvae. They pupate out of the larvae in the leaf mine. 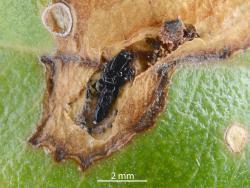 One forms black faecal pillars around the black pupa that help support the walls of the leaf mine. The other appears to be a large wasp. When the adult wasp has emerged from the pupa and its body and wings have hardened, it chews a hole in the leaf mine through which it emerged. 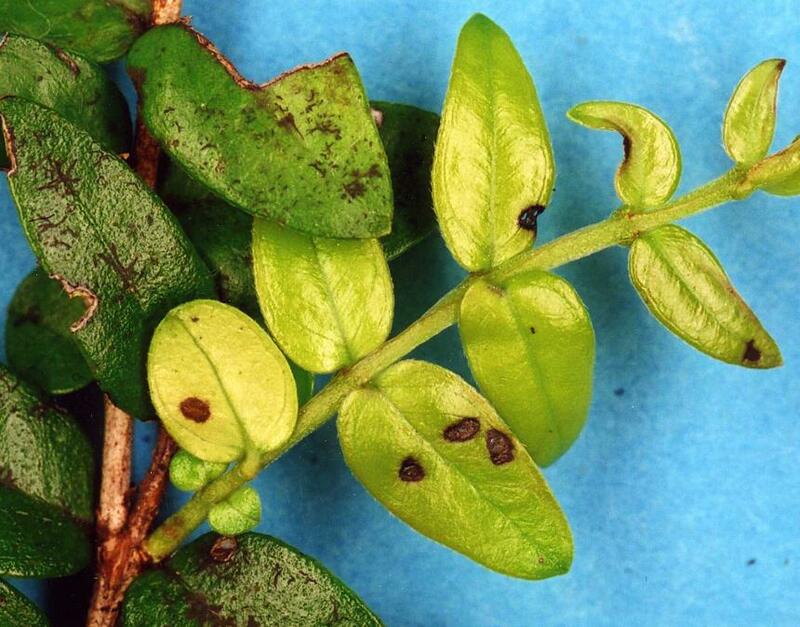 The pohutukawa leaf miner weevil lives on medium and large-leaved rata (Metrosideros) trees and climbers, including a tropical species (Metrosideros kermadecensis) grown in Auckland gardens. Adult beetles were once found feeding on leaves of a small-leaved climber, Metrosideros diffusa. 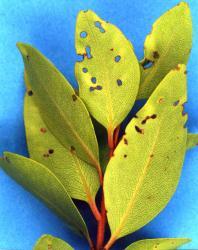 Normally the leaves of this species do not have the characteristic round leaf feeding holes. 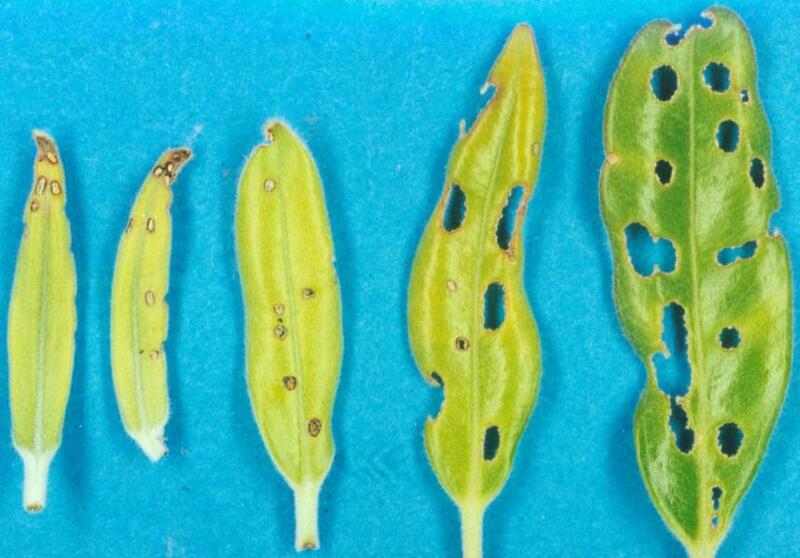 The weevil larvae and adults both feed on leaves, but each causes different kinds of damage. Larvae burrow through leaves forming long serpentine mines that gradually widen. The mine is most obvious on the upper side of leaves. 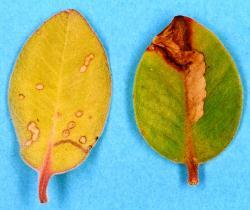 Larval mining may cause leaves to fall prematurely. Adult weevils feed on young leaves, making round or oval holes in the leaf with their rostrum (snout). 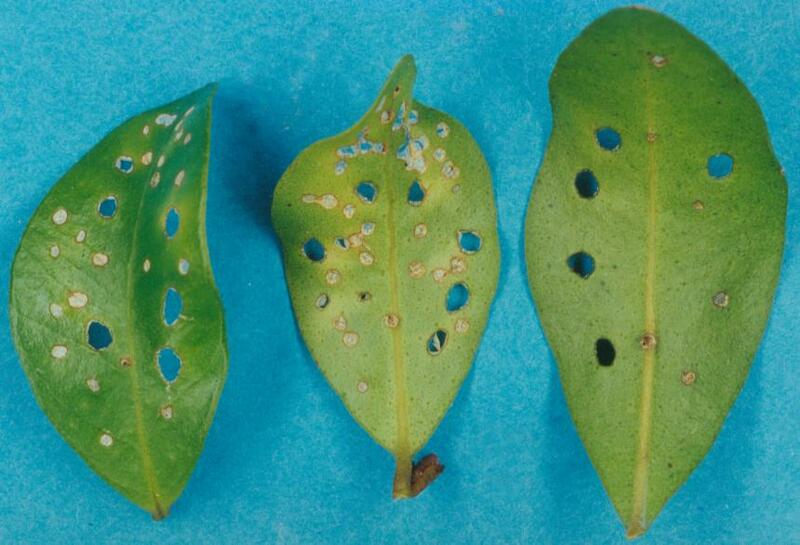 If the leaf has reached full size, the holes stay small. However, if the leaf is still growing, the holes become larger as the leaf expands. 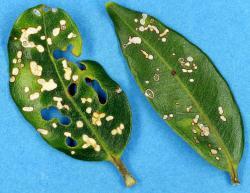 When many adult beetles feed on small leaves, the leaves may be killed. 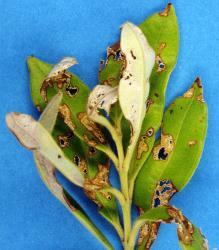 Why are the young leaves of some trees heavily damaged? 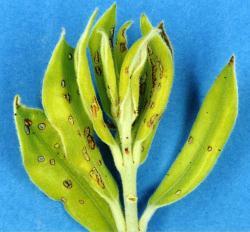 3. more than one flush of young leaves, so that the weevils can breed more than once each year. Table: Host plants of the Pohutukawa leafminer, Neomycta rubida (Coleoptera: Curculionidae) from Plant-SyNZ database (5 June 2015). The reliability score shows the quality of evidence for the host association (1-10, 10=high). 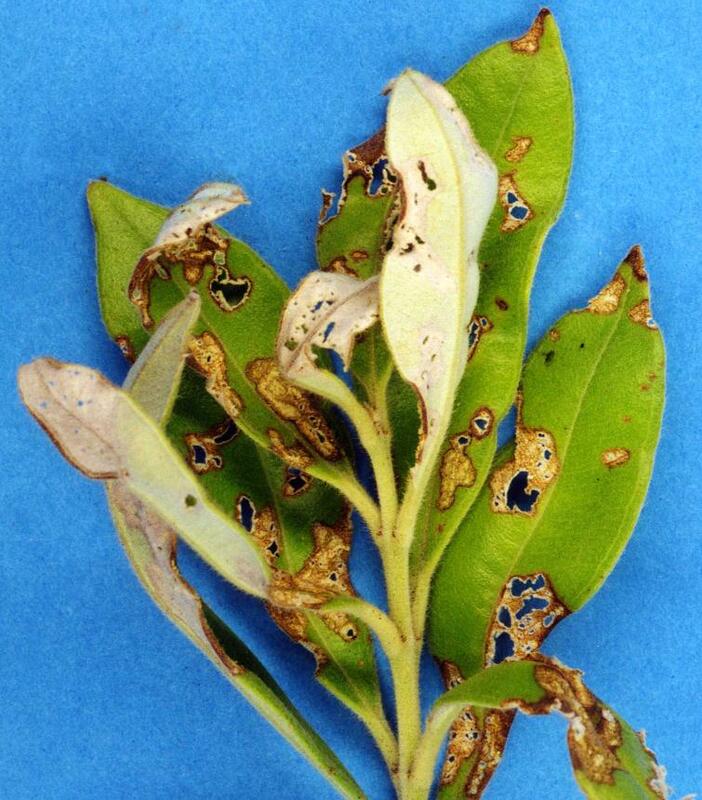 Adult pohutukawa leaf miner can cause large amounts of damage to young leaves of some pohutukawa trees in gardens and parks. 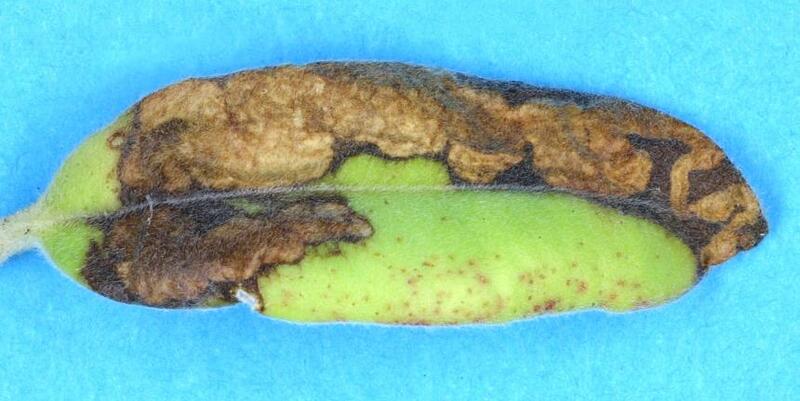 If this is of concern, plant selections that are less susceptible to damage by the weevil should be grown. Ornamental tropical rata (Metrosideros kermadecensis) plants may sometimes be heavily damaged. 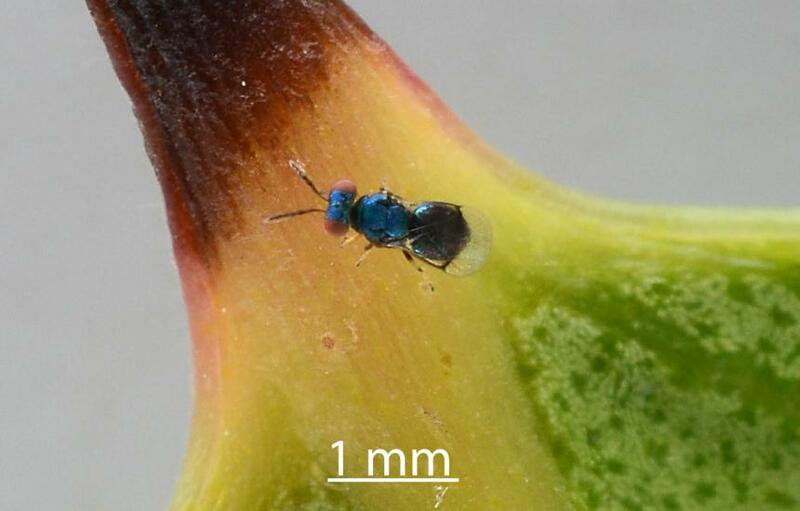 If the plant is small, the adult weevils may be picked off the young shoots at night or the shoots can be tapped over a bowl into which the adult weevils can fall. 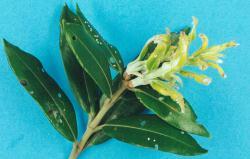 If this does not work or the plant is too large, an insecticide could be applied to the young foliage in the evening. 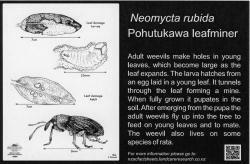 Damage to young leaves of pohutukawa and northern rata by the weevil has sometimes caused concern, but is not believed to be a significant factor in the decline of these species. 1. Do newly emerged adult weevils feed? 2. 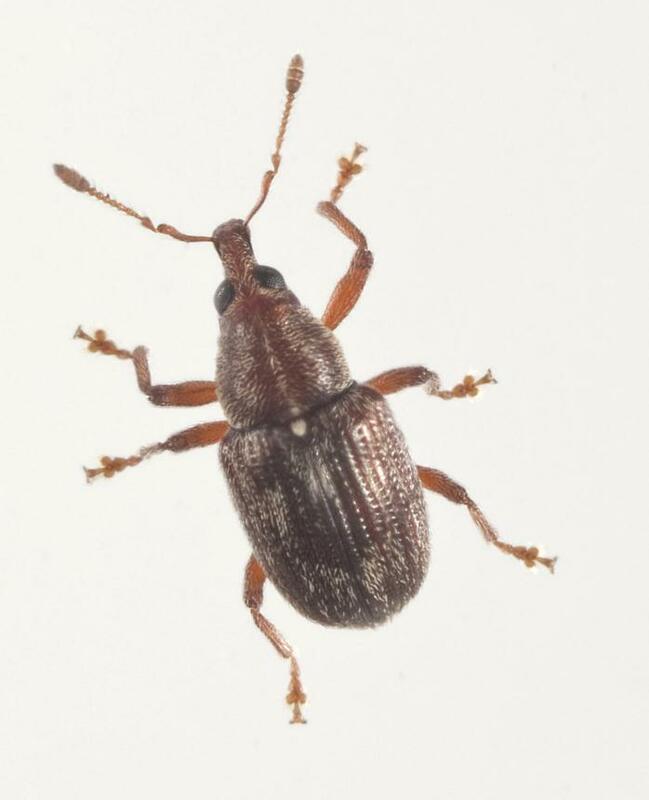 If so, on what do the adult weevils feed in the absence of young leaves? 3. 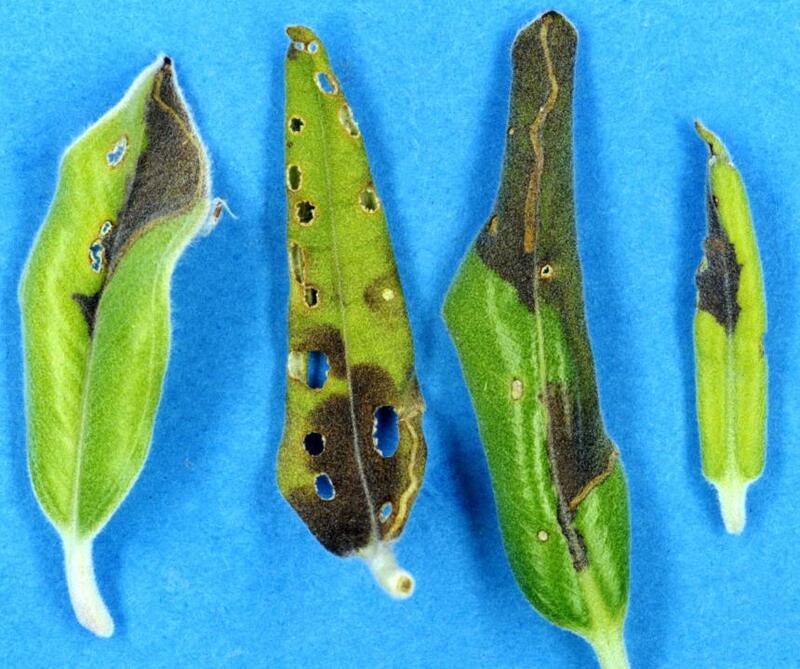 How do they know when plants are producing young foliage? 4. Also, how do adult males and females find one another? The signs for the Pohutukawa leafminer are best placed by trees where the adult beetle has made many small holes in young leaves. 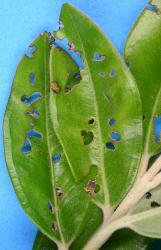 The holes may be larger in older fully expanded leaves. 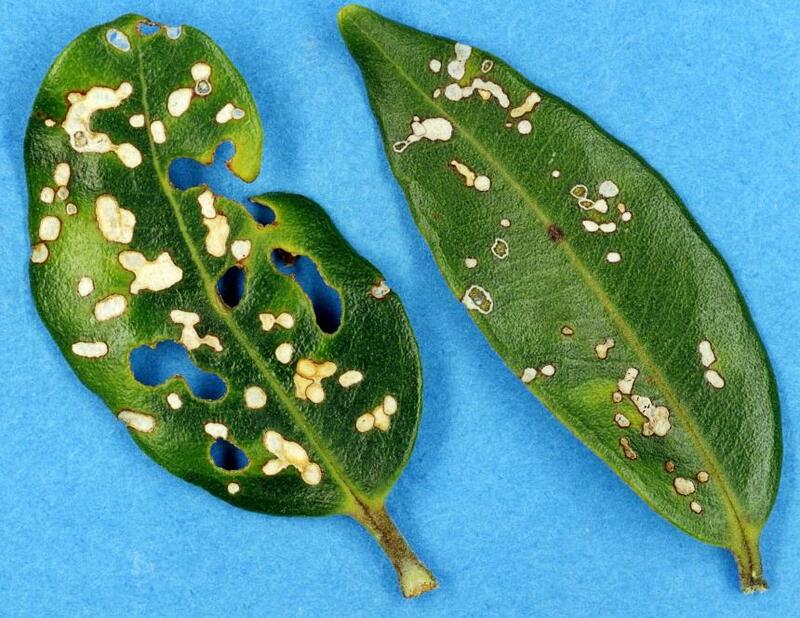 It is unlikely that people will see the leaf mines. Leaves with mines, tend to drop off. Kuschel G 2003. 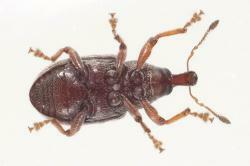 Nemonychidae, Belidae, Brentidae (Insecta: Coleoptera: Curculionoidea). Fauna of New Zealand 45: 1-100. May BM 1993. 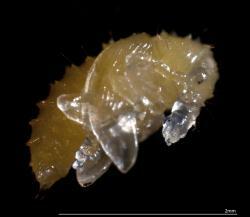 Larvae of Curculionoidea (Insecta: Coleoptera) a systematic overview. Fauna of New Zealand 28: 1-223. 1 September 2018. NA Martin. 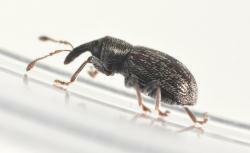 Two photos of a mating pair of weevils were the wrong species and have been removed. 1 September 2017. NA Martin. Added photos of adults mating. Natural Enemies, parasitoids with photos. 5 June 2015. N A Martin. 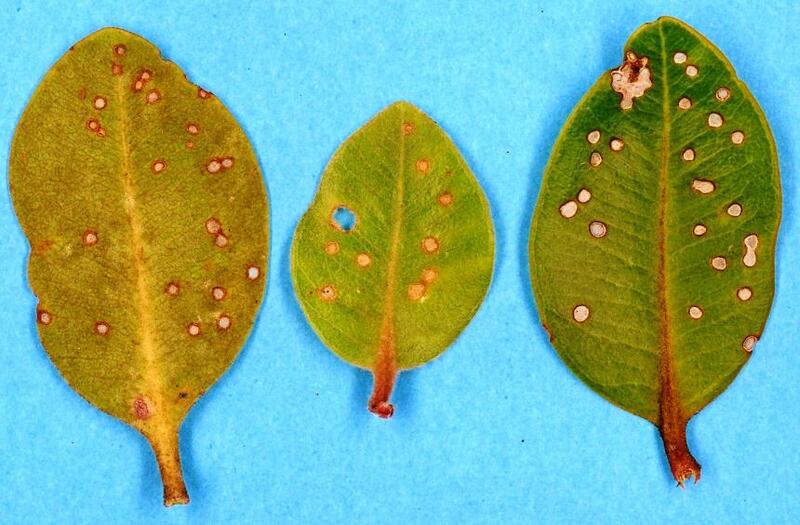 Annual Cycle: reworded and added photograph of adult feeding damage to young leaves and a photo of a pupa. Details of Bug Signs added. Martin NA. 2010, revised 2018. 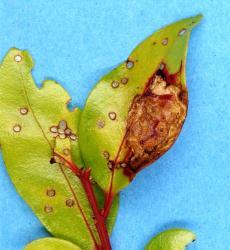 Pohutukawa leafminer - Neomycta rubida. Interesting Insects and other Invertebrates. 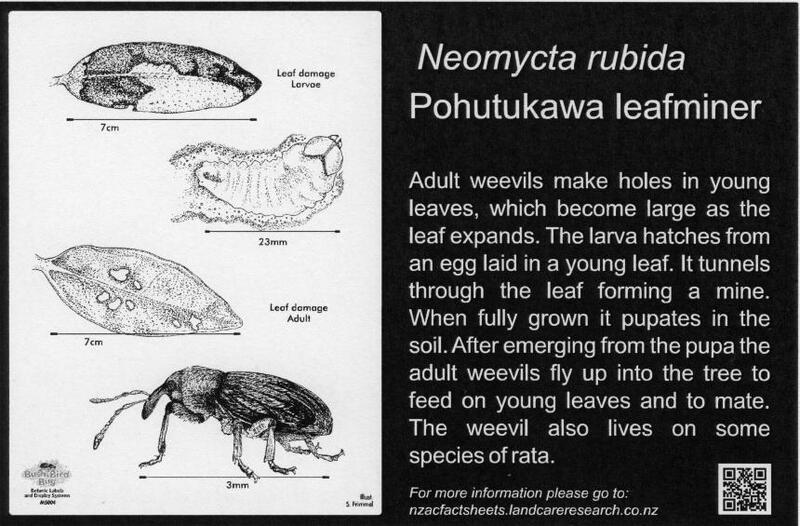 New Zealand Arthropod Factsheet Series Number 4. http://nzacfactsheets.landcareresearch.co.nz/Index.html. Date Accessed. ISSN 1179-643X.